Eric Hyyppa is the Director and General Manager of KUSM Television, MontanaPBS, in Bozeman, Montana. As Director, he oversees a university licensed state network covering all of Montana. 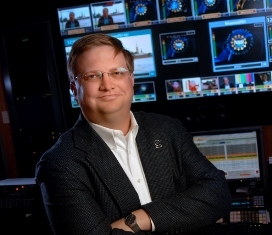 He is a PBS veteran, with over 20 years in public broadcasting and over a decade of experience in television production, including work for every major network and many independent companies. Before becoming General Manager in 2006, Eric served MontanaPBS as Information Systems Manager. He has a background in Information Technology, including a BS in Computer Science. He is a former member of the Society of Motion Picture Television Engineers and the Society of Broadcast Engineers. During his tenure at MontanaPBS, the organization has grown from a single station to a statewide network of six stations, more than 20 translators, and a satellite delivery service that reaches the smallest communities in the state. The organization has expanded local production, including a number of nationally distributed programs, grown local support, and been a leader in the use of technology for highly efficient station operations. As GM, Eric has overseen the launch of a major and planned giving program, expansion of local news and public affairs programming, and an expanded emphasis on education, specifically leveraging the PBS LearningMedia platform in Montana. In addition to a number of boards in Montana, Eric currently serves as chairman of the board of trustees of America’s Public Television Stations (APTS), is past chairman of the board of directors of the National Educational Telecommunications Association (NETA), is past chair of public television’s Affinity Group Coalition (AGC), and is past co-chair of the Organization of State Broadcasting Executives (OSBE).